Everyone on internet right now is buzzing about the latest feature introduced by google dubbed as “Style Ideas”. It seem to be perfect for those, who spend their hours on Google images just to search for ideas before they went shopping or placing their online order. The first time when I saw this feature – a British newspaper website [ DailyMail ] came up in my mind. Which is using the similar idea of selling products of advertisers on their website. I’m not saying that one of the worlds biggest company Google have stolen this idea. But, there seemed to be sufficient evidence that this isn’t the idea by Google Inc. DailyMail whenever covers a story on their showbiz section. They always place the information about the dresses, shoes, bikinis watches or handbags those celebrities are wearing during those covering stories. Google Style idea is also following the same idea, which clearly raises the question that; “Is this the Google’s idea?”. Above is the latest story covered on DailyMail’s showbiz section. 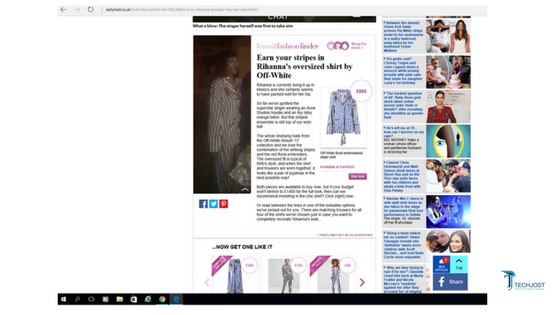 Here you can see how the DailyMail is offering a Oversized White shirt a popular artist Rihanna is wearing casually for 895 Pounds. If you can visit this section you’ll notice that; every story magazine covers they offers their followers the brands info about what those celebrities are wearing. Something, which google team may have noted and with some changes launched it under the name of Google “Style Ideas”. In a ethical way it’s not wrong if you do such thing but, provides the credit where it is due. But, if you say you are the one who introduced this or came up with this idea then question will be raised. Google’s feature will help people around the world a lot and its audience will be very happy. It will have a very positive effect on e-commerce industry and people will start to shop more and more online then in stores.